The substance of this website is contained in a database listing of all known burials; as is found in most small community cemeteries, record keeping was not accurate and because of circumstances headstones were not erected. In some cases field stones were used to indicate a burial, in some instances dates and/or initials were placed on the stone. Even when records were noted they often times used references meaningful at the time but now useless as they are out of context. The first burial at Grantsburg Cemetery was a child, Charles Land on April 15, 1851; in spite of noting this important date there is no documentation as to his parents. Several readings have been done at this cemetery over the years and we are fortunate to have these works. The reader should note the dates of previous readings as they evaluate their findings. Others have mentioned that all graves have headstones ; this is not correct. Previous markers erected are showing the wear of time and are becoming unreadable which validates the value of all previous readings. The research sources used in this project include notes kept and passed down by cemetery staff, notes and records on file at the library, various field readings of Historical Society Members placed into publication and extensive on-site work in the cemetery. The creator of this work has many direct and allied family members buried in Grantsburg as well as surrounding cemeteries therefore bringing a sincere honest effort to get things correct. In some cases, public health death certificates were available to assist this effort. The burial listings are more powerful than you imagine as they are presented in a format which allows a sort of each column independently and the information properly flows along accordingly. Contained in the menu at the right top are various opening views; this simply means that the first view you see when opened is as labeled on the tab. Grantsburg Cemetery currently consists of a plot of land due west of Grantsburg; the cemetery currently consists of 13 rows. These 13 rows run North and South; most headstone inscriptions are on the West side of the headstone, although there are several exceptions. Each row contains many graves; if the plot is referenced as #09 15, this indicates this grave is located in the 9th row from the West and is approximately the 15th grave south in the row. Certain names in this listing shows as a different color; this means it is a hyperlink that, when clicked, will take you to a Rootsweb database of researched family genealogy listed by Maiden name. This link will open a fresh page to a different Rootsweb driven database where you can see any documentation, more family detail, download information and create reports. Nearly 10% of total burials at Grantsburg are Veterans; at least 38 men have served their country. Twenty-one (over 50% of) these veterans served long and hard during the Civil War. During this project two Civil War veterans were identified as well as serval others of a later era. The 23rd, 38th, 49th, 53rd, 66th and 81st Indiana Regiments constitute the bulk of the service, mostly infantry. Yates 9, Wright 21, White 8, Voglesong 5, Seaton 12, Scott 11, Sarles 4, Roberson 48, Ritchie 4, Peterson 4, Miller 4, McMahel 7, Martin 8, Landiss, Harris 8, Hamilton 7, Grants 8, Goodson 4, Goldman 5, Froman 6, Ford 8, Ferguson 7, Denbo, Byrd 5, Brown 4, Blevins, Bennett 6, Barnett 11 and Adkins 3. From a public health point of view it is interesting to calculate life span. For that purpose I eliminated all deaths 10 years of age or less to recognize that there was a very high infant/child mortality in the era before preventable disease practices. In this reduced database we have 301 persons, the oldest on record lived until 104 and the youngest died at 12. The mean average life span for those buried at Grantsburg is 66.1 years. 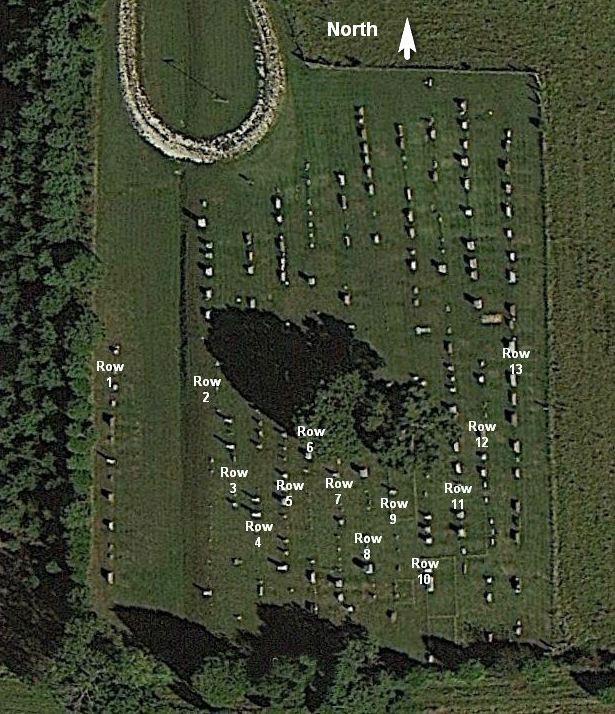 You can find the cemetery on find a grave at this link: Grantsburg Cemetery on Find A Grave.